Quang Nam is becoming one of the hottest destinations of Vietnam with a wide range of world heritage sites: the ancient town of Hoi An, My Son sanctuary, and the Cham Island biosphere. Quang Nam is a province in Vietnam South Central Coast. The name Quang Nam means extending to the South. With the area of 10.440 square kilometers and the population of more than 1.4 million people (2014), Quang Nam ranks the 6th in the size and the 19th in the population among 63 provinces and cities of Vietnam. Quang Nam Cultural region is formed in the overall culture of central region.Quang Nam culture is formed in the overall culture of Central region. Located in the midpoint of the country, according to the North-South axis, Quang Nam is the reconciliation of cultural nuances between two regions and cultural exchanges with outside which contribute to the rich tradition of Quang Nam and the unique cultural identity. Coming to Quang Nam, tourists can contemplate the beauty of ancient architectural works reaching the peak of art. There are 2 world cultural heritages recognized by UNESCO including Hoi An Ancient Town and My Son Sanctuary with the typical cultural values of humanity. Hoi An town is the convergence of various cultural nuances of Vietnamese people, Chinese, Japanese and European since the 16th century. Hoi An is one of the few towns preserved relatively intact with a rich and diverse architectural complex. 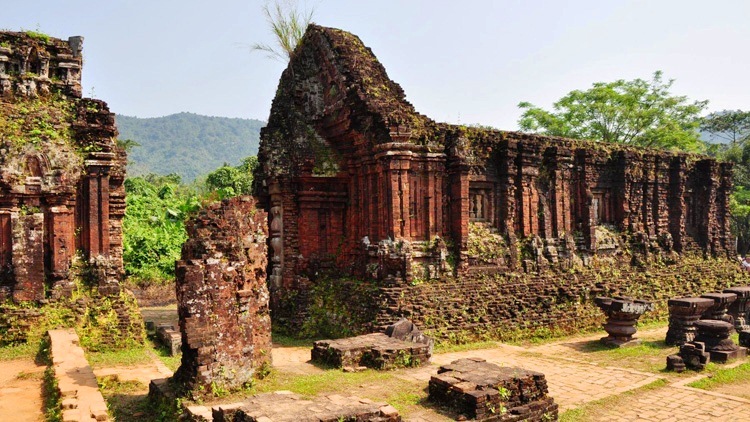 Quang Nam is also the place that stores hundreds of ancient Vietnamese architectural works as temples, pagodas, literature temple, houses, etc dating back 300 to 500 years ago. These relics not only have the values of culture and art but also bring important historical significance, reflecting the long-standing development of a cultural area. Tra Kieu ancient capital, Khuong My cham towers, Chien Dan, Bang An, Dong Duong Buddhist Institute is the place recording the brilliant imprints of Sa Huynh Culture, Cham Culture and Dai Viet Culture. The cultural values of Quang Nam not only shine from the ancient architectural works but also is made up of unique colorful culture embodied in the traditions, customs and habits and festivals of ethnic groups living in this land. This is an invaluable asset and the pride of Quang Nam people. Referring Quang Nam culture, we cannot but mention to the folklore treasury as Ve Quang, ho di cay, ho xay lua, ho tat muoc, bai choi singing... With the valuable tangible and intangible cultural values, Quang Nam is really a vibrant cultural sub-region in Vietnamese culture. Quang Nam is the land of cultural tradition in Central Vietnam, the convergence of world cultural and natural recognized by UNESCO including Hoi An Ancient Town, My Son Sanctuary and Cu Lao Cham - the world's biosphere reserve. Hoi An Ancient Town is located about 30km far from Da Nang city to the southeast, about 60km away from Tam Ky city to the northeast. From the late16th century, Hoi An was the International Trade Center on the commercial route East - West, the most prosperous commercial port in Dang Trong during the reign of Lords Nguyen, because merchant ships from Japan, China, Portugal, Spain, Netherlands and so on often came here to exchange, purchase and sell goods. Hoi An preserved relatively intact an ancient architectural complex including houses, communal houses, temples, pagodas, well, bridge, clan ancestral houses, port, markets and streets. The landscape of Hoi An is covered by an ancient mossy color as a vivid picture. This is considered a lively museum in architecture and urban lifestyle. Japanese Covered Bridge (Cau Pagoda) is an architectural works constructed by Japanese traders in Hoi An in the early 17th century. Due to the impact of natural disaster, Japanese Covered Bridge was restored many times and gradually losen the Japanese architectural elements, instead Vietnamese architecture style. It is an invaluable asset and has been selected as the official symbol of Hoi An. Quan Thang Ancient House (77 Tran Phu, Hoi An)is one of the most beautiful ancient houses in Hoi An today. The house dates back more than 150 years bearing the architectural style of Hoa Ha, China. Over the years, the house has still been preserved relatively intact on the architectural design and interiors, is the evidence for the most brilliant time of Hoi An when trade activities with foreign partners flourished and rich traders built luxury houses. Located in Duy Phu commune, Duy Xuyen district, My Son Sanctuary can be said to be the pinnacle of Cham culture. This is the place where religious rituals of Cham dynasties took place and royal tombs were constructed. Despite its modest scale, My Son Sanctuary has cultural, historical and architectural values which are considered equal to those of Angkor Wat in Cambodian, Pagan in India and Borobudur in Indonesia. 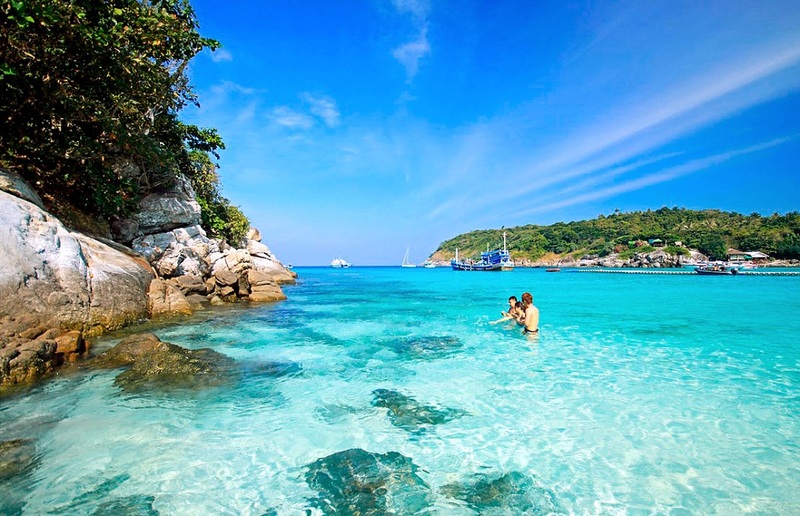 Cu Lao Cham - the world's biosphere reserve Located about 18km from Cua Dai Beach (Hoi An) to the South China Sea, Cu Lao Cham is an archipelago including 8 small islands: Hon Lao, Hon Kho Me, Hon Kho Con, Hon Tai, Hon dai, Hon Mo, Hon La and Hon Ong. 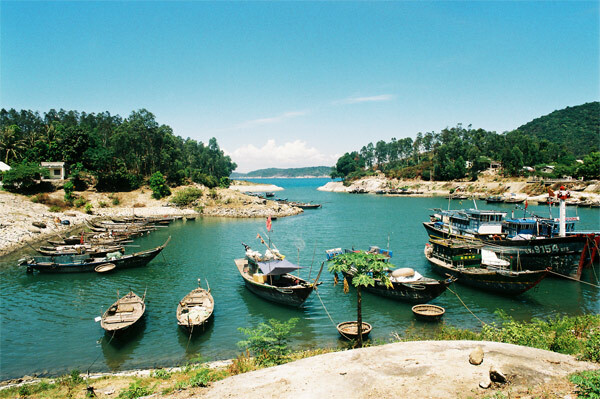 In Cu Lao Cham, there are fishing villages and beautiful beaches as the tale "The Old Man and The Sea" by Hemingway. Under the sea, there are many sparkling coral reefs creating magical aquarium with thousand of fishes and tropical seafood. Coming to Cu Lao Cham, tourists can mingle in the fresh air of the sea with the golden sands, blue waters, explore the daily lives of the residents in fishing villages; admire the charm of many legendary landmarks as Huong beach, Lang beach, Ba cave, Au Thuyen, Hai Tang pagoda... or conquer the majestic hills, participate in campfire and enjoy famous specialties. Few years ago, was recognized as the world biosphere reserve by UNESCO. Typical cultural values of Quang Nam is deposited in the festivals, in the customs and habits, traditions; is extracted from the labor process, thinking, behaviors of the ethnic communities living together in this land. Quang Nam festivals bears the characteristics of traditional folklore. All bear elements of belief, spirituality, held every year to pray for good weather, prosperous country; to honor those ancestors; towards the roots and traditions of the nation and express the desire to reach the beautiful soul of people here. Typical festivals consist of Goddess Thu Bon Festival, Chiem Son Festival, Carnival Hoi An and Hoi An New Moon Festival. Goddess Thu Bon festival is a folk festival of people living along Thu Bon River to pray from good weather and prosperous lives. The festival is held on December of the2rd lunar month.Carnival Hoi An is the street festival held for the first time in Hoi An on New Year's Eve in 2009. The festival is modeled Street Carnivals in Europe and Latin America. New Moon Festival is held on every 14th evening of lunar month in Hoi An Old Town. 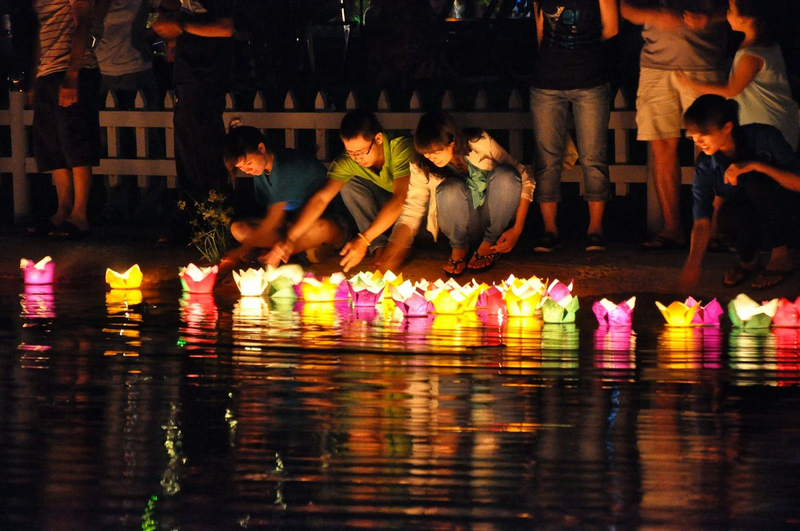 At this time, local people will all buildings turned off their white lights leaving only the colored lanterns to cast warm glow over the buildings and off the water. Unlike modern streets, Hoi An becomes so poetic at night without electricity. Tourists are enchanted by this space because they seem to be lost in an ancient space in modern time.